5' American Garden Swing. Dimensions: 66" x 88". 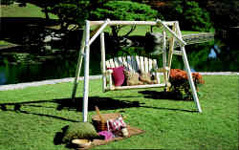 These swings are our most popular item. They feature quality construction not found in other swings. Enjoy peaceful afternoons and starry evening skies for many years to come.